In her latest book, Åsne Sierstad—the author of The Bookseller of Kabul—follows the true story of two Norwegian sisters, who reject their parents’ moderate Islam to embark on a journey that leads, ultimately, to jihad in Syria. It’s a story familiar in the UK, where we have seen cases of teenagers like Amira Abase, Begum and Kadiza Sultan from Bethnal Green Academy running away to Syria in 2015. Teenage rebellion is nothing new and religion can be a powerful flashpoint between parents and their children, convinced that the older generation has got it all wrong. As radical Islam attracts teenagers in 21st century Europe, so in early modern England the Reformation produced versions of Protestantism and Catholicism that provided powerful ways for children to reject their parents’ beliefs. The Protestant Jacobean Archbishop of York, Tobie Matthew (1544-1628), suffered one of the most high-profile teenage rebellions when his son, also called Tobie Matthew (1577-1655), converted to Catholicism, eventually becoming a Catholic priest. As a leader of the Protestant Church of England, this was embarrassing enough for Archbishop Matthew, but to make it worse, Archbishop Matthew had a reputation for hunting down and persecuting Catholics. His son was converted and then ordained by some of the Archbishop’s longstanding enemies in the Catholic Church. Archbishop Matthew’s pursuit of Catholics was relentless and driven by a genuine belief that Catholics were damned and the agents of Satan. Matthew saw Catholics as traitors and rebels, and the gunpowder plot of 1605—when Catholic plotters tried to blow up parliament—just confirmed his beliefs. Archbishop Matthew spent his career persecuting Catholics and was part of the regime that executed the Catholic gentlewoman, Margaret Clitherow, by crushing her to death between stones in York in 1586. 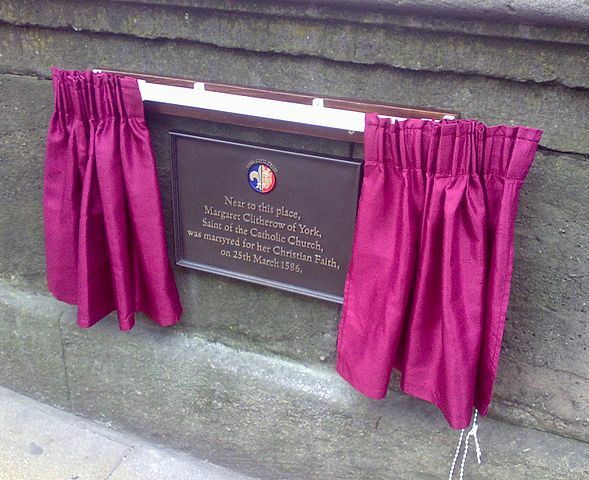 Image credit: Commemorative plaque for Margaret Clitherow on the Ouse Bridge, York. Photo by Pabloasturias. CC BY-SA 3.0 via Wikimedia Commons. Not only did Tobie Matthew Jr., question his father’s values, he embraced the religion that Archbishop Matthew had devoted his career to destroying. In 1605, Tobie Matthew Jr. begged to be allowed to travel abroad but, suspecting his motives, his parents initially refused. His mother, Frances, even offered him her fortune if he stayed in England and married. Eventually, Tobie Matthew Jr. was allowed to go on the condition that he only went to Protestant countries, but needless to say, as soon as he crossed the channel he went to Italy, the heart of the Catholic Church, and converted to Catholicism. Tobie Matthew Jr. knew the impact that his conversion would have on his parents, writing that “it would be to take a sort of life” from his parents “who gave their life to me”. Indeed, his parents were devastated. Archbishop Matthew told his son that he had broken Frances’ heart, telling him to stay away from his mother—whose happiness the Archbishop rated above the lives of a “hundred sons”. Nor did it change Archbishop Matthew’s views of Catholicism; he continued to prosecute English Catholics as his own son, Tobie, was in and out of prison and eventually forced into exile for his own Catholicism. If teenage rebellion is a constant theme through history, so too is parental love. Whatever Archbishop Matthew may have claimed, he and Frances devoted endless time and effort to protecting their oldest son. Frances looked after Tobie Matthew Jr. when he was ill and Archbishop Matthew sent friends and colleagues to try and convince him to convert. After he was ordained as a Catholic priest—still seen as a crime—Tobie Matthew Jr. came to stay with his parents in the Archbishop’s palace and Archbishop Matthew assured colleagues that his son was just going through a rebellious phase. Tobie Matthew Jr. never did return to Protestantism, going on to have an illustrious career as an author and translator of Catholic texts—he may even have become a Jesuit, embracing the extreme end of early modern Catholicism. When Archbishop Matthew died in 1628, he was still bitter at his son’s religious choices—noting in his will how much he had been forced to pay out to support Tobie Matthew Jr.
Archbishop Tobie Matthew’s own parents may have nodded their heads in recognition at the pain he suffered at the hands of his own son. Back in 1559, when the Protestant Queen Elizabeth had just succeeded the Catholic Mary I, a young man left his Catholic family in Bristol for Oxford University. That young man was Tobie Matthew—the future Archbishop of York—and his Catholic parents were horrified when he decided to become a Protestant minister. Matthew, of course, was convinced he was right just as Matthew Jr., knew his was the path to true salvation and happiness. Father and son were more alike than either would have liked to admit. Featured image credit: York Minster from the Lendal Bridge. Photo by andy. CC BY 2.0 via Wikimedia Commons. Dr Rosamund Oates is a Senior Lecturer in Early Modern History at Manchester Metropolitan University. 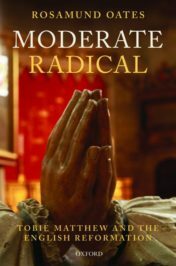 She is the author of Moderate Radical: Tobie Matthew and the English Reformation (OUP, 2018) and runs the international network and blog, Communities of Print: 1400-1700. She is currently working on signed languages for the deaf and renaissance preaching. Sorry to disappoint you Dr. Oates but you’d be hard pressed to name the “versions” of Protestantism or Catholicism that compare with “radical” Islam. You are attempting to show linkage, where there is none. What “children” rejected their parents’ belief? One, you found him, and wrote a book. Good for you. Let’s not say this was anything that typified the Reformation please. And certainly don’t try to link the Reformation with radical Islam.